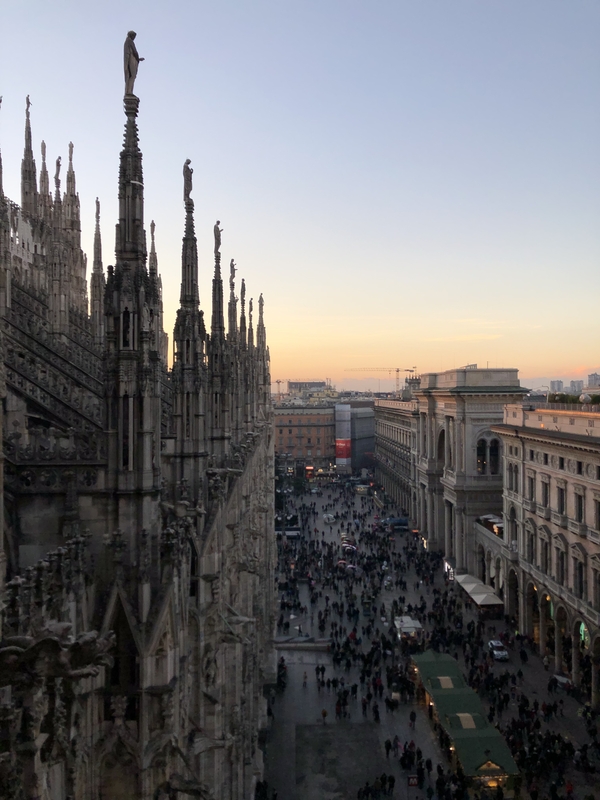 This month, 13 eager students, including myself, began a Study Abroad experience of a lifetime: LIM’s 2019 Cross-Cultural Analysis program in Milan and Paris. 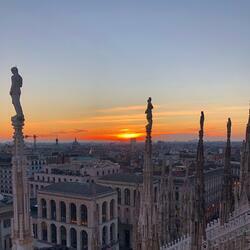 The first destination was Italy’s fashion capital, Milan. 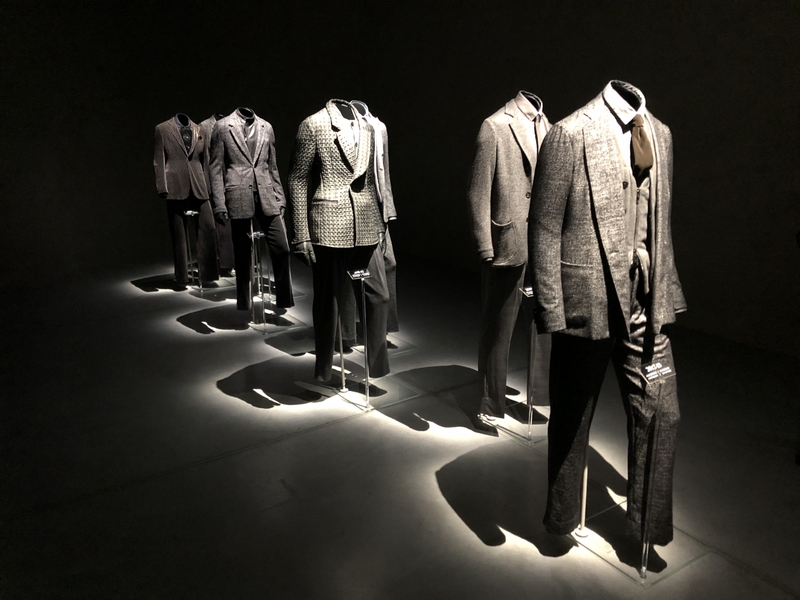 During our four days in Milan, we journeyed through the city’s culture, food, architecture, and, our main focus, its fashion industry. The morning we arrived, we were greeted by a beautiful sunrise and the mountains in the distance, and we were all ready to immerse ourselves in this northern Italian city. 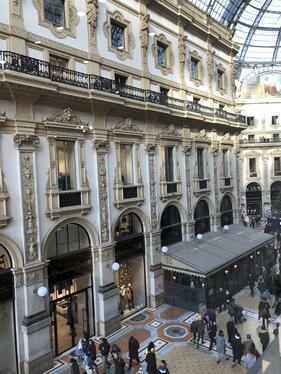 After a short bus ride, our local tour guide showed us the country’s oldest shopping mall, Galleria Vittorio Emanuele II. 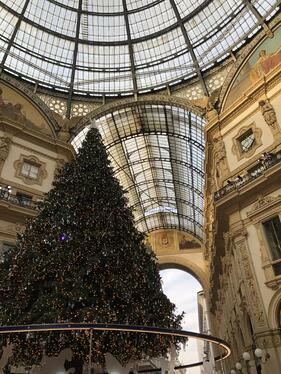 This mall houses some of the most luxurious fashion stores, such as Prada, Versace, and Gucci, and there was a dazzling Christmas tree at the center. We then went to the hotel, where we were welcomed with lunch and coffee. An assortment of meats, cheeses, and breads put us all in a sleepy state, leading to most of us choosing to relaxing in the hotel, until we all met up for an aperitif and delicious dinner by the Duomo. Saturday, we were guided through the rest of the city center. 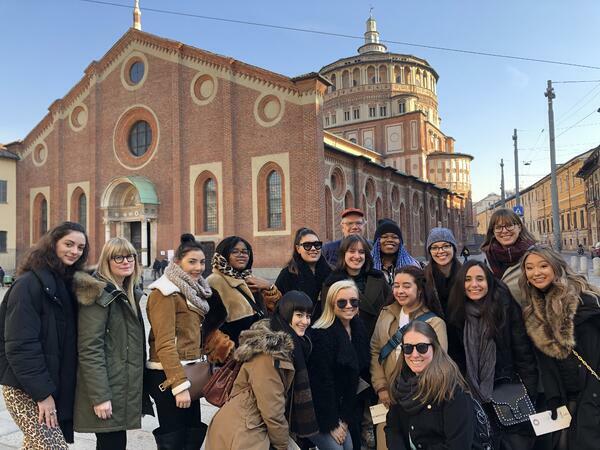 First on our agenda was visiting the famous Santa Maria delle Grazie church and convent, which contains the The Last Supper mural by Leonardo da Vinci. For preservation purposes, we could not take pictures inside and were only allowed to view the mural for 15 minutes; however, it was marvelous to see in person and something I will remember forever. After this, we walked for two hours in the city, passing by chic boutiques, coffee shops, and restaurants. We went on a spontaneous visit inside San Maurizio al Monastero Maggiore church, with intricate baroque and renaissance architecture. On the third day, some of us attended the Epiphany Parade near the Duomo, while some relaxed at the hotel. After the scenic ride along the Navigli Canals, we enjoyed lunch at the Armani café before our guided tour of the three-floor Armani/Silos Museum. After this, a number of students stayed near the canals for dinner and shopping. 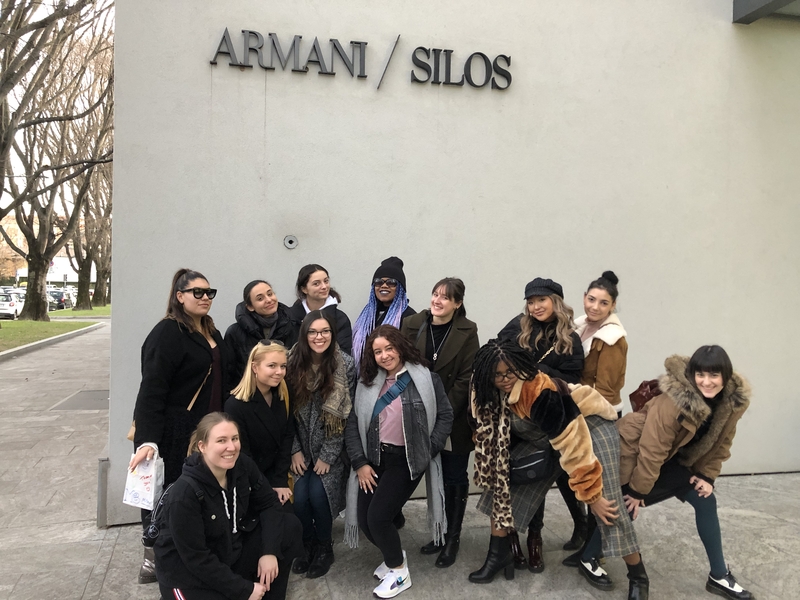 Monday was our final full day in Milan, and it involved two very exciting industry visits: Versace and A+A Design Studio, an international consulting and forecasting agency. Both companies were very informative about their business strategies, methods, and trend books. Versace was particularly inspiring, as we were the first school to ever be invited into the Palazzo Versace for a presentation; we were even gifted the Donatella Versace picture book. After this long day, we had free time for dinner and said goodbye to our beloved gelato, pasta, and pizza. Tuesday morning, we headed toward the airport for our flight to Paris. Grabbing our last cornettos—Italian croissants—and espressos, we said goodbye to this lively, modern, and yet historic city. This was a short visit but a once-in-a-lifetime experience that wouldn’t have been possible without LIM’s well-planned itinerary and the College’s connections to the global fashion industry.